Eastern Europeans love figs in every conceivable form, including jam. 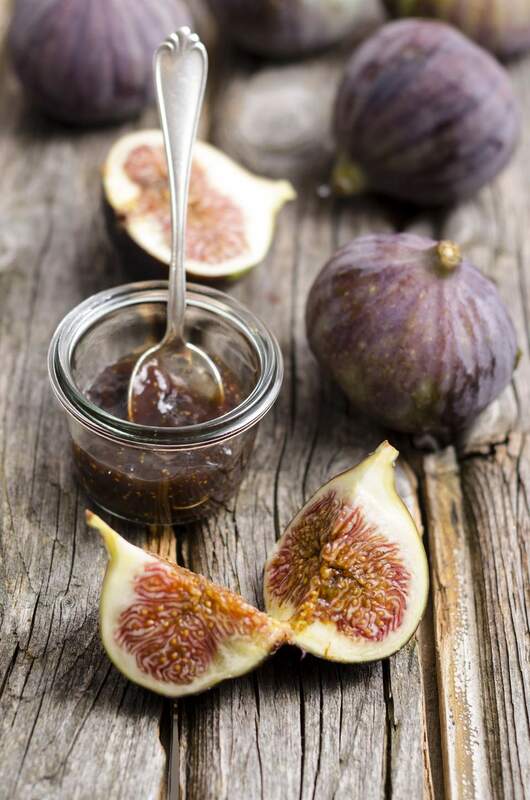 Some of the world's best figs grow in Croatia along the Dalmatian coast, and they end up in fig tarts, fig breads, salads, stuffings, candy, compotes and jams and preserves. Place a small ceramic or glass plate in the freezer. Stir together 1/2 cup of the sugar and pectin in a small bowl and set aside. In a large, heavy-bottomed saucepan, combine remaining 1/4 cup sugar with figs, lemon juice, and honey. Cook over medium heat, stirring occasionally until it comes to a simmer, 5 to 6 minutes. Whisk in the sugar-pectin mixture and turn heat to medium-low. Use a wooden spoon to gently mash the figs and break them apart (you want a chunky texture, not mush). Continue to cook, stirring occasionally, until mixture reaches 212 F on a candy thermometer, about 8 to 10 minutes. If you like a firmer jam, cook longer. Skim off any foam that rises to the surface. Remove plate from freezer and spoon a small dollop of jam onto it. The jam should set up semi-stiff and when you run your finger through it, the trail should not run back together immediately. If it does, keep cooking. If it doesn't, turn off the heat and let the figs sit for 10 minutes. Fill a large stockpot or canning pot with water and bring to a boil. Add jars, lids, and bands, and simmer 5 minutes. Use tongs to remove them to a clean kitchen towel. Once cool enough to handle but still warm, fill the jars nearly to the top with hot fig jam, leaving 1/2-inch headspace. Screw lids on. Add more water to the pot, if necessary, and bring to a boil. Place a canning rack in the pot and set the filled jars into the rack. Boil for 10 minutes (the filled jars should be completely covered by the boiling water). Using tongs, remove the jars and place on the kitchen towel. If refrigerating, be sure to cool the filled jars a few hours first. Unopened, the jam will keep for a few months. After opening, try to eat the jam within a week or two. Source: "Dam Good Sweet" by David Guas & Raquel Pelzel (The Taunton Press, 2009). How Do You Make Easy Strawberry Jam?